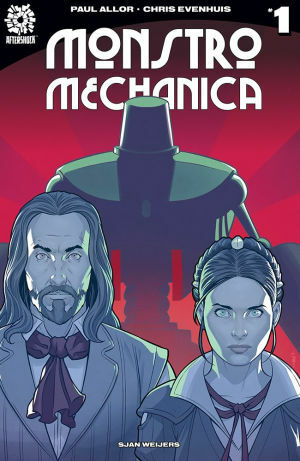 The description of "a new series starring Leonardo da Vinci, his female apprentice and their wooden robot" kind of says it all but it's only scratching the surface of this charming new series from AfterShock Comics, Monstro Mechanica. Paul Allor and Chris Evenhuis create a thoughtful and thrilling new adventure during the Renaissance with one of history's most dynamic figures. Fifteenth century Florence, Italy is and has been a great setting for intrigue, romance, adventure, and suspense. The Italian Renaissance is best known for its achievements in painting, architecture, sculpture, literature, music, philosophy, science and exploration. One of those responsible for bridging Medieval and Modern Europe was literally referred to as the original "Renaissance Man" was Leonardo da Vinci. He was widely considered one of the most diversely talented individuals ever to have lived. His varied talents from painting to engineering are on full display in Paul Allor's story of the brash and brilliant inventor. And while there's plenty of political drama between the Pope and the Medici family, it's Leo's mentorship of Isabel and the question of identity that makes this more than just another fictional historical comic. DaVinci was so adept in so many disciplines you could say he was the "Mary Sue" of his day or as the creator of the television series DaVinci's Demons David S. Goyer described him, "there are certain similarities to Sherlock Holmes, House, and Tony Stark." A person as accomplished as DaVinci lends itself to legend and appearing larger than life. He's the perfect subject to be fictionalized with very little need to exaggerate much. Would it be a stretch to believe he created a wooden robot in 1492 as described in "Monstro Mechanica"? Maybe, but this automaton serves as his bodyguard from the forces that challenge his more scientific endeavors which put him at odds with the Pope. A papal hit squad could be lurking just around the corner. If you've played or seen the video game 'Assassin's Creed' you get the idea of a cloaked figure stealthily following its target around a marketplace. So Allor incorporates a lot of the political intrigue that pits DaVinci against the Pope and the powerful Medici family. Those storylines are intricate and strategic. The relationship DaVinci has with his apprentice is more straightforward and illuminating. Isabel is told she dresses like a boy and is mocked as such. We're not sure why she dresses that way but the reason she sees the robot as a "he" is revealing. Her perception of the robot as strong, big, and powerful as masculine traits could be a hint. Perhaps, in her mind, she believes in order to be taken seriously as the young female apprentice to the odd but brilliant DaVinci, she needs to project a male persona. It's a thought she conveys to DaVinci who rebuffs such an idea telling her she'll learn soon enough those traits aren't reserved for one gender. Their relationship is complex, he's hard on her to follow his instructions, she has her own agency and their philosophical differences over the robot will be a big driving point going forward. Chris Evenhuis and Sjan Weijers create a vibrant and beautifully rendered 15th Century Florence complete with period-appropriate wardrobe and architecture. Evenhuis' pencils are very clean without a wasted line. The character designs are well done with some diversity in those portrayed. Weijers' colors keep it light and bright with hues that pop yet are rich.The art is a visual treat. 'Monstro Mechanica' is an enthralling historical mash-up featuring the larger-than-life figure of Leonardo da Vinci with a dash of science fiction mixed with suspense and political intrigue. The titular character plays an important role that is still evolving but it's the mentor/apprentice relationship that elevates this new series to new heights. You'll be hard-pressed to find a more entertaining debut this year.